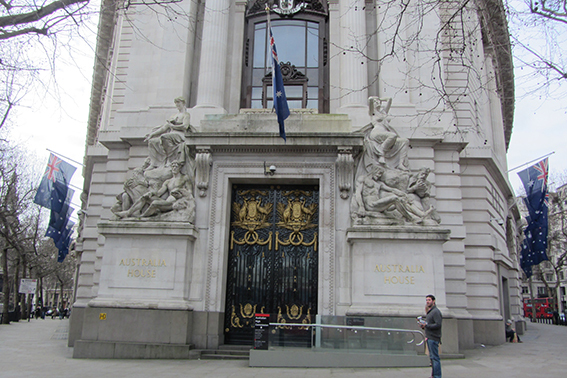 To celebrate some urban geology on Australia Day, we’re going to take look at the stones used at Australia House, the Australian High Commision on the Strand WC2B 4LA. The building was designed by Scottish architect Alexander Marshall McKenzie and completed in 1918. Although the main building stone on the exterior is Portland Stone, the foundations and interior decorations use stones imported from Australia. The foundations are of interest to igneous petrologists. They are constructed of Bowral Trachyte, an 182 Ma trachyte from Mount Gibraltar in New South Wales. It is of mineralogical interest, with distinctive, rust-brown phenocrysts of siderite replacing clinopyroxene, slightly pitted in a fine grained, pale brown alkali feldspar matrix. 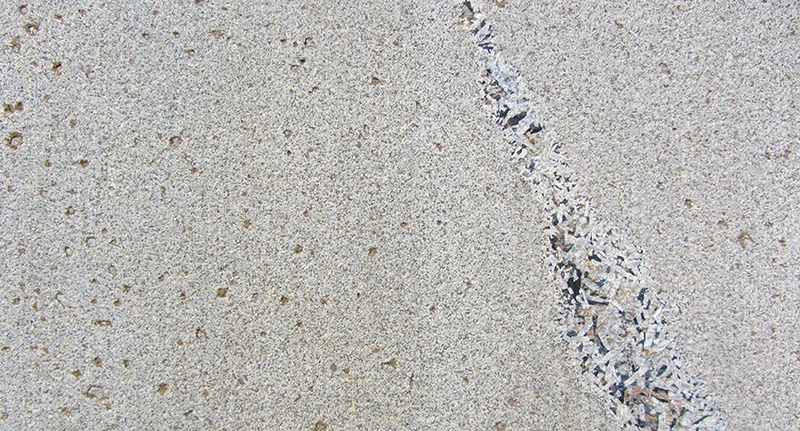 It is cut through by miarolitic veins and veinlets (’pegmatites’) containing euhedral white feldspars (up to 8 mm) and interstitial pyroxene and Na-amphibole. Calcite and stilpnomelane after clinopyroxene are also present (below). 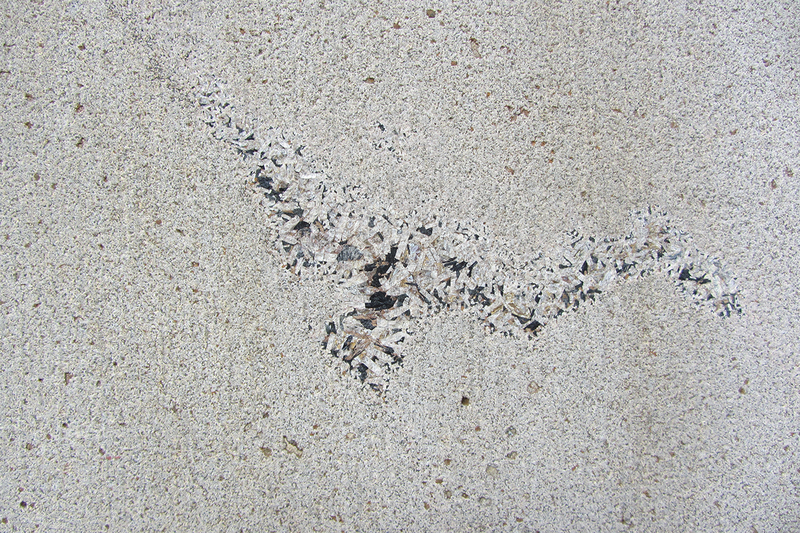 One of the pegmatites, appropriately, has the shape of a kangaroo on the cut surface of the stone (below). The trachyte was derived from a high-level sill, a laccolith, emplaced during the Jurassic into the Triassic Hawkesbury Sandstone of the Sydney Basin. It is part of a series of intrusions known as the Mittagong Igneous Province, An alkaline, anorogenic granitic suite, with carbonate-enriched melts. The quarries on Mount Gibraltar, ‘The Gib’, opened in 1885, taking advantage of the railway that had arrived in 1867. The last quarry (Loveridge & Hudson Quarry) closed in 1986. Bowral Trachyte is frequently seen as a building stone in Sydney, but this is the only example of it’s use in the British Isles, to my knowledge. The interior of the building is worth a look if you are able to visit. 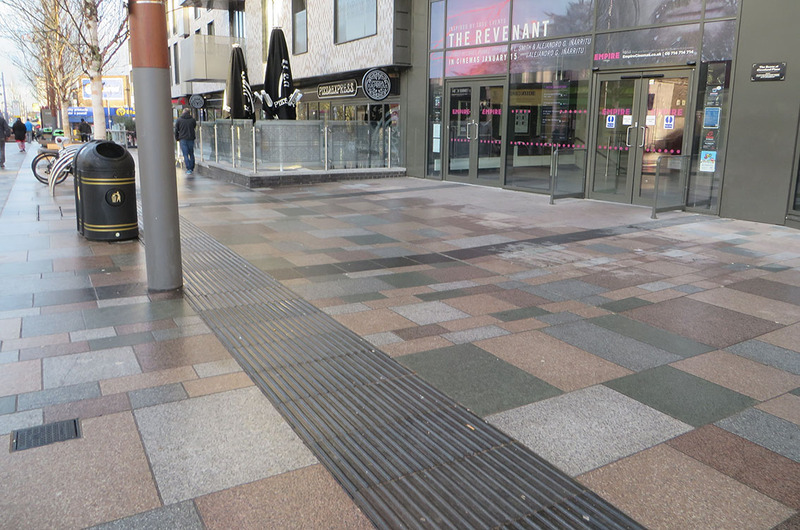 A selection of Australian Marbles are used for revetment, paving and columns. 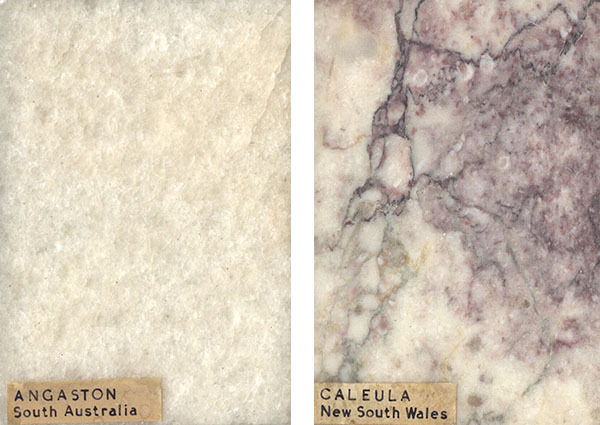 These include Angaston, Caleula and grey Buchan Marble. Although not well known internationally, Australia has some fine marble deposits and much effort was made in the early 20th Century to export these to Europe. Unfortunately, competition from the Mediterranean marbles prevented the souther hemisphere contenders from being taken seriously by architects. Caleula was the most distinctive and does occasionally crop up in building interiors. The samples of Angaston(left) and Caleula (right) below are from the Collections at UCL Earth Sciences. This building features on London Pavement Geology here. London Pavement Geology now has 57 building stones recorded in East London’s Canary Wharf development. 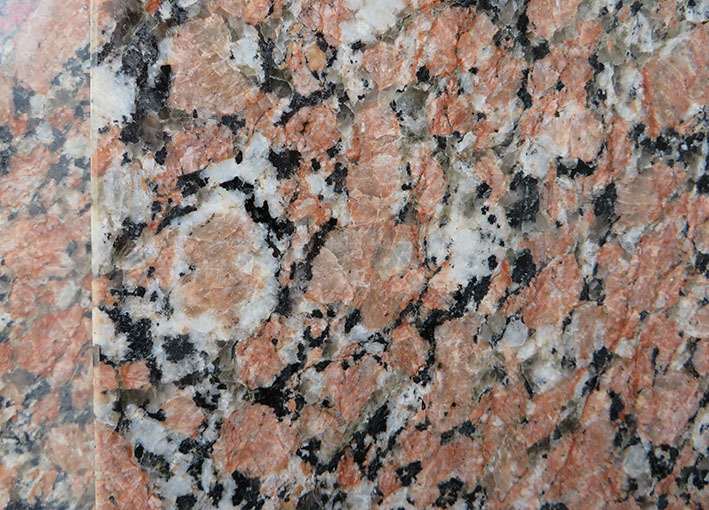 The buildings here have used spectacular stones from all over the world, including Brazilian granites and North American marble. Here is an article on some of the stones used from The Wharf by Beth Allcock entitled ‘Top 5 Geology Facts about Canary Wharf‘. You can also download a self-guided tour of Canary Wharf’s stones here and join Ruth on a guided walk on Saturday January 23rd 2016 for London Walks. No booking is required, meet at Canary Wharf tube (main entrance opposite the Reuter’s Building) at 2.30 pm. £10/£8 concessions.